Line-profile variability and excess profile broadening (usually referred to as macroturbulence) are the two main characteristics of blue supergiants (BSGs). A link between these two characteristics has recently been found, which suggests that they have a common physical origin - stellar pulsations. The presence of pulsations in some BSGs has been established from both spectroscopic and photometric observations. 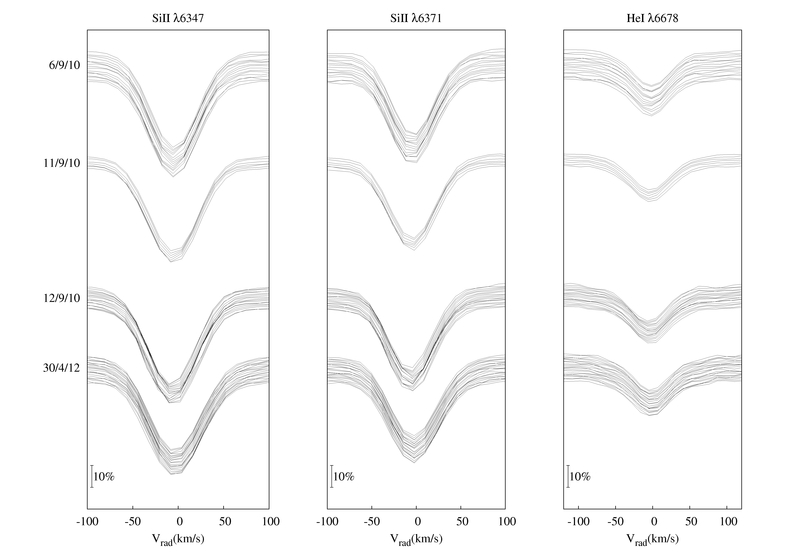 Updated computations revealed that the pulsating BSGs are located within an instability domain in which predominantely higher g-modes can be excited, while at the hot end of this instability domain p-modes could be excited simultaneously, resulting in mixed modes. The periods attributed to these pulsations are on the order of hours to about one day (p-modes) and 2-10 days (g-modes). Using the Ondřejov 2m-telescope, we found indications for line-profile variability in the late-type BSG star HD 202850. This is shown in the folling plot for three photospheric lines. We analyzed the variability by means of the moment method. The first and third moment of all three lines show a periodic behaviour, and a period of P = 1.59 h was obtained (see the following figure). The second moment is rather noisy making it difficult to unambiguously confirm a periodic behaviour. However, indications for a double sine seems to be present. If true, this would speak in favour of an axisymmetric mode. The stellar parameters of HD 202850 place this star outside any known instability domain. 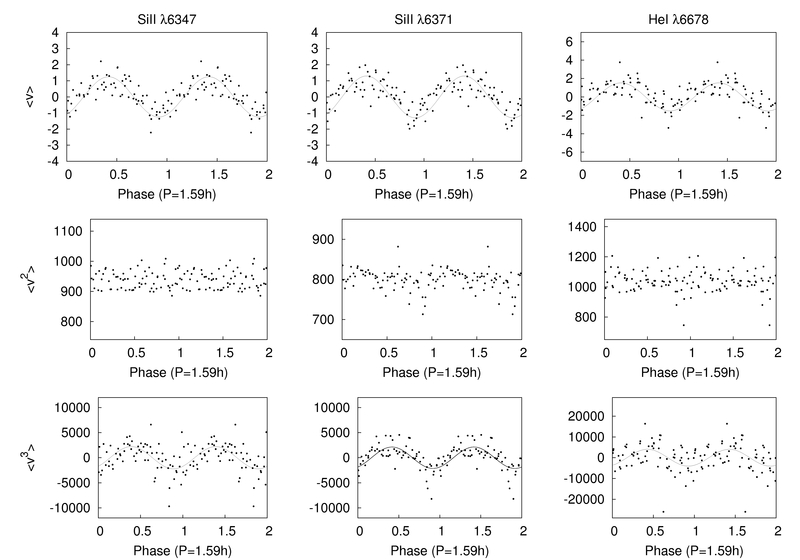 Also, its very short period disagrees with periods of g-modes predicted for late B-type supergiant stars. HD 202850 is hence a very interesting object and a challenge for asteroseismology.